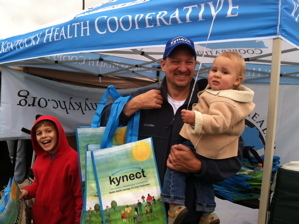 Pitching health care in Barbourville, at the Daniel Boone Festival. As 2013 comes to a conclusion and a new year emerges, there’s more than midnight kisses and champagne toasts to celebrate this time around – 2014 also brings with it access to affordable health care coverage for thousands of Kentuckians for the first time. 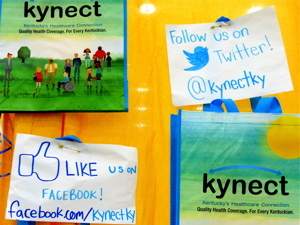 kynect, the online marketplace run by the Kentucky Health Benefit Exchange, has been up and running since October 1. Coming into the Thanksgiving holiday, on average 1,000 citizens per day were enrolling in health care coverage. From Thanksgiving going into the Christmas holiday that number doubled to 2,000 per day. And on December 23, the deadline for individuals to guarantee coverage to begin on New Year’s Day, 4,000 applications were processed. As of Monday, over 115,000 Kentuckians have new health care coverage – and there are three more months of open enrollment to go. While kynect has not had the same level of technical difficulties experienced by the federal website, healthcare.gov, it has produced its fair share of glitches and surprises. Yet lost amid the political scream-fest between conservatives and Democrats over the merits of Obamacare, is the ambitious challenge undertaken by those responsible for providing a functional plan to provide health care to the majority of uninsured Americans, and that it was able to be implemented across 50 states. Talk about a gleam of hope. I have worked with one client for going on two months now to get her application straightened out. She is homeless and has severe health issues that have rendered her only able to earn sporadic income from odd jobs. Is she pleased about her circumstance? No. But she is fighting to get the help she needs, and that help was not available previously. This woman has waited for four months to get an appointment for some critical tests in Lexington. If she didn’t have insurance coverage in place by the first week of January she would have to wait another four months until an appointment perhaps became available. Without a revenue stream in place, it’s possible the tests she needs might not have been made available to a person in her situation without the advent of the Affordable Care Act. That is a health hazard many in America are fortunate enough never to have to encounter. Critics of the Affordable Care Act (ACA) want to casually shrug off this social aid program as only providing free health care to those that don’t want to work. The ACA does help find coverage for those with little or no means, but it also offers comprehensive health plans to families making a respectable wage, to also minimum wage workers, and to older Americans hoping to retire, but have not yet reached Medicare eligibility. These folks are currently hostages to employer sponsored plans and must continue to work because they have pre-existing conditions. They would either be denied coverage from insurers before the Affordable Care Act came along, or charged exorbitant premiums. As Gov. Steve Beshear has tirelessly pointed out, these people without insurance are not aliens from another planet. They are our neighbors in many cases. They shop at the same grocery stores as you and me, and we all sit together in the stands on Friday and Saturday nights watching our kids play sports, and attend the same churches. Often they are our family members. I could not be more proud of Gov. Beshear and his staff for what they have done in making the availability of affordable health care coverage a reality in Kentucky. And as Hillary Clinton so accurately pointed out, “It Takes A Village,” and that is what has allowed kynect to succeed in Kentucky. There is the determination and professionalism being exhibited by the staff at the Kentucky Health Benefit Exchange (KHBE), along with members of the Cabinet for Health and Family Services, that refuses to allow there to be any wrong door for Kentuckians to approach when having questions about their health care applications. Certified insurance agents and trained kynectors are in all 120 counties assisting people with completing their applications. There is technical support from Deloitte, who built the portal through which applications are processed on kynect.ky.gov, along with CGI. It can take weeks to get peoples’ applications freed up for completion depending on the severity of the glitch discovered. Lists are kept of loopers, superloopers, super-dooper-loopers and flippers. It sounds like something out of a Dr. Seuss tale, and often it feels like “Who-ville” in the kynect Command Center. Enough can not be said for the expert assistance Deloitte’s team has provided KHBE staff in troubleshooting the technical reasons behind why peoples’ applications have not gone as expected. Jacy and Isabella help me hand out tote bags at Court Days in Mt. Sterling. There also is Xerox, who has been instrumental in addressing the questions that come from the public and other invested professionals through the kynect call center. Customer service representative have fielded well over 100,000 calls to this point. In the end all the political upheaval can be cut through with one simple question. Do you or someone you know currently NOT have health insurance? If that is the case, take a look at kynect.ky.gov, I think you’ll like what you find. It’s possible you, a friend or a family member might qualify for free or discounted health insurance coverage. 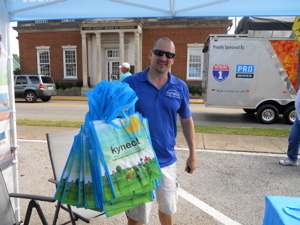 This entry was posted in Events, News and tagged Affordable Care Act, kynect, Obamacare, Steve Beshear. Bookmark the permalink.